HouseinHand KNX is an application for Apple iOS and Android devices that allow you to control your home in a very fast and intuitive way. HouseinHand KNX is an application for Apple iOS and Android devices that allow you to control your home in a very fast and intuitive way. Control your KNX devices (lights, blinds, climate…), audiovisuals (tv, audio stations, DVD), door communication systems and IP cameras (Axis and Mobotix) wherever you are, in real time. There is no need to buy an expensive server to control your KNX installation from an Apple iOS or Android device. Houseinhand KNX connects directly to a KNX IP router or gateway (KNXnet/IP compatible) as well as other IP devices. You will be able to monitor your IP cameras when you are away from home, check if you left some light turned on when you going to work, adjust the room temperature before getting home, turn off your heat pump and many more. 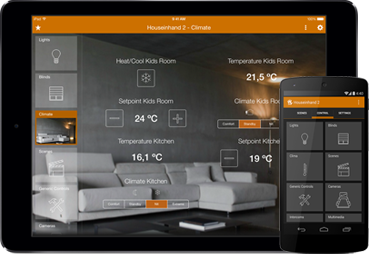 Houseinhand KNX interface has been designed for all iOS and Android devices. Optimized for retina displays, offers different interfaces depending on whether it is a smartphone or tablet. 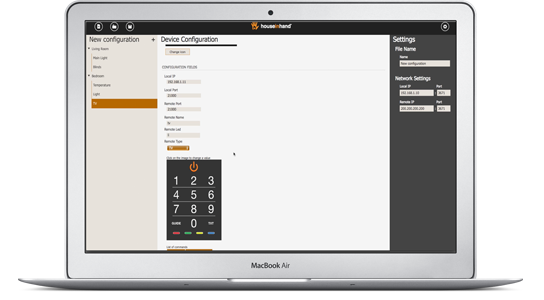 Houseinhand KNX interface is available for Apple iOS and Android devices. Download it now and start controlling your home! Houseinhand KNX allows to control not only KNX devices but also IP cameras, audiovisual devices and door communication systems. You will have all your house in the palm of your hand. Houseinhand KNX allows you to create your own custom scenes. You can set up, as an exemple, the “relax” scene that will adjust the main light to 30% and configure the set point temperature to 25 ºC. It is possible to try Houseinhand KNX in a few minutes. You just need to register in user.houseinhand.com, configure your home with the designer.houseinhand.com and try Houseinhand KNX. Since it does not need a server, communication is instantaneous. You will see how the status of the lights, blinds, thermostats and other devices are updated in real time. Houseinhand KNX App can be downloaded from the iOS App Store and from Google Play for free. It will launch in demonstration installation. With App you can control up to 6 Houseinhand widgets just signing up in user.houseinhand.com. If you like it and want to control more than 6 widgets please see licensing section. Are you a system integrator and want to try configuring HouseinHand KNX? If you go to the designer you will be able to test HouseinHand KNX in a few minutes. The Designer is available from any web browser and always updated to the last available version. If you have any special requirement or question about our company and our products, please do not hesitate to contact us.